Oh my goodness... I am so glad that the Christmas is over!! Now I can craft for me!! Don't get me wrong, I love making handmade items for my friends and family but this year it just seemed like it was non-stop! 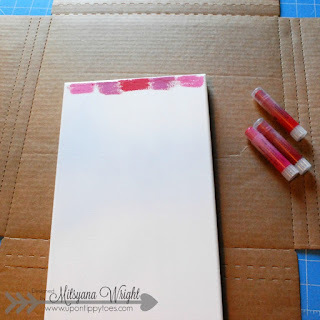 Between crafting gifts, school parties, and design team projects I was beside myself!! During this holiday season it was eat, drink, breathe, CRAFT!!! So, now that everything is generally getting back to normal, I can make pretty things for me!! 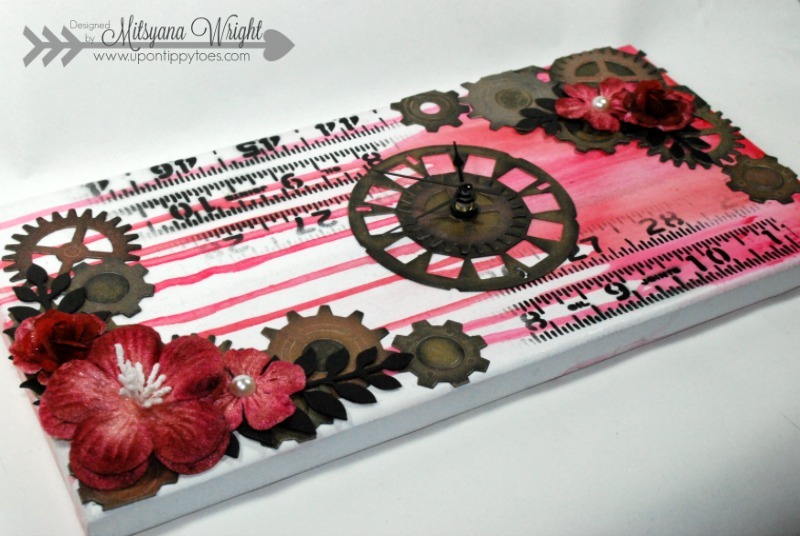 And I made myself a mixed media clock. Because mixed media on canvas is pretty and all but I have a piece of art that is also functional!! YAY!! 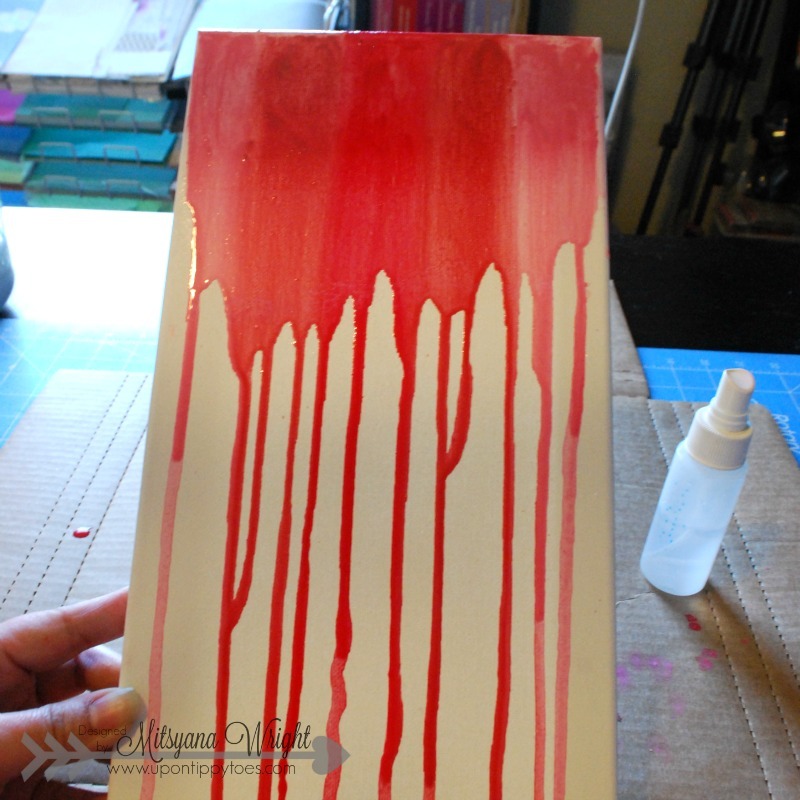 I started off my by using this 7"x14" stretched canvas. I like to buy my canvas pre-primed. It saves me from doing an extra step and drying time always kills me... It's literally watching paint dry! I'm so darn impatient! 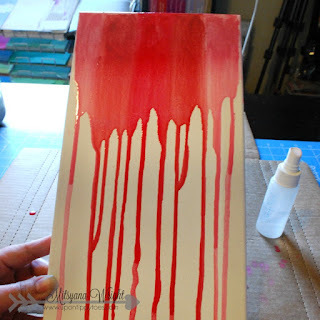 I took 3 different shades of "reds" and rubbed them directly onto the top of my canvas. With a spray bottle filled with water, I misted my gelatos. I tilted my canvas to allow the drips to flow down. 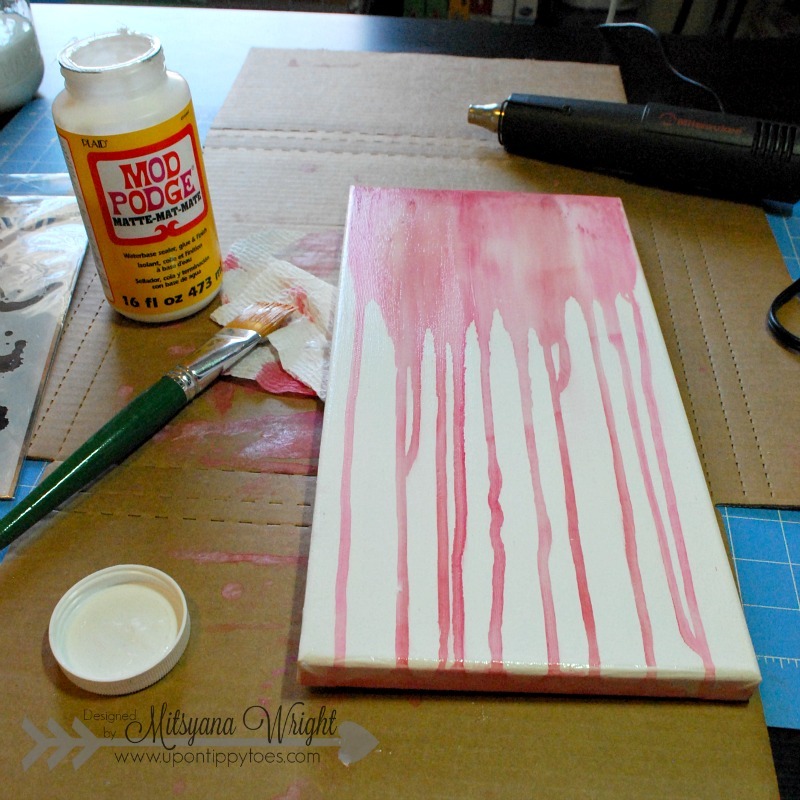 I repeated these steps till I got the amount of "drippage" I liked... I think I may have repeated those steps about 2 or 3 times. 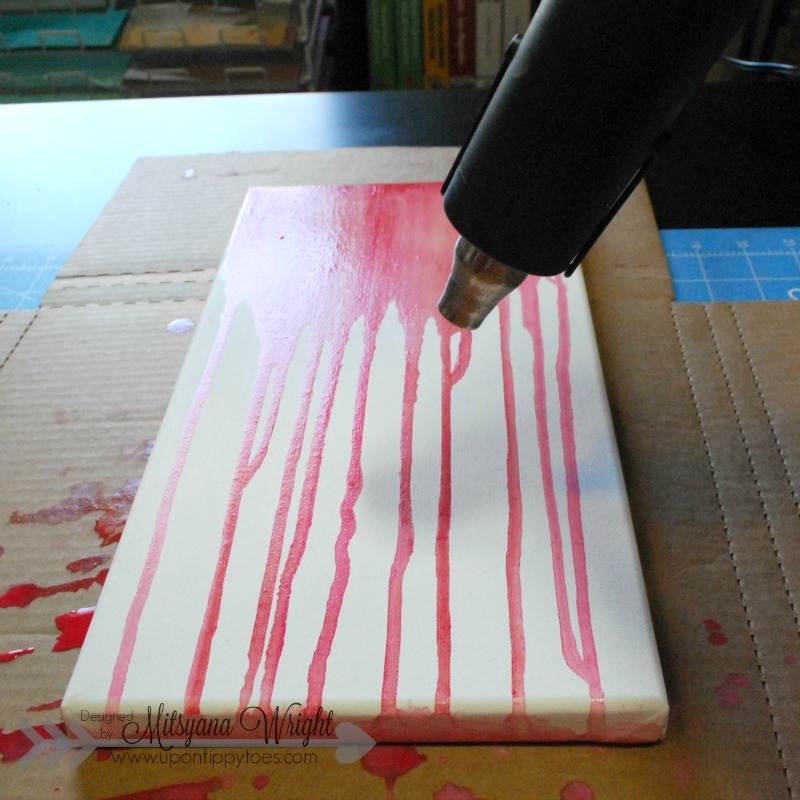 Then I used my heat tool on the drips to hurry drying time. Once it was dried I sealed my drips with a coat of Mod Podge and set aside to dry. 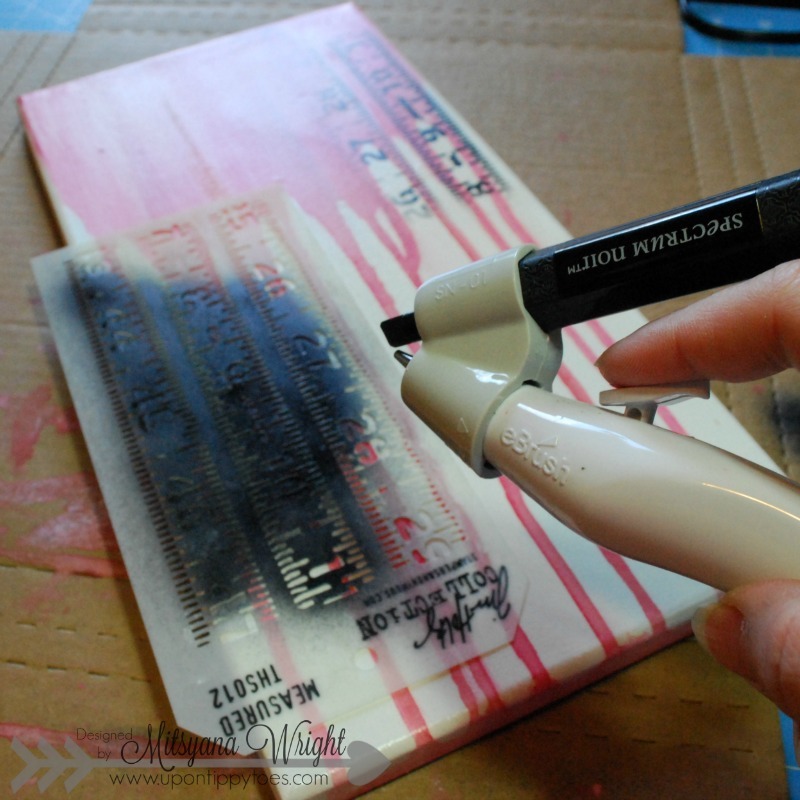 Then I used this my ebrush to airbrush this ruler pattern onto my canvas. 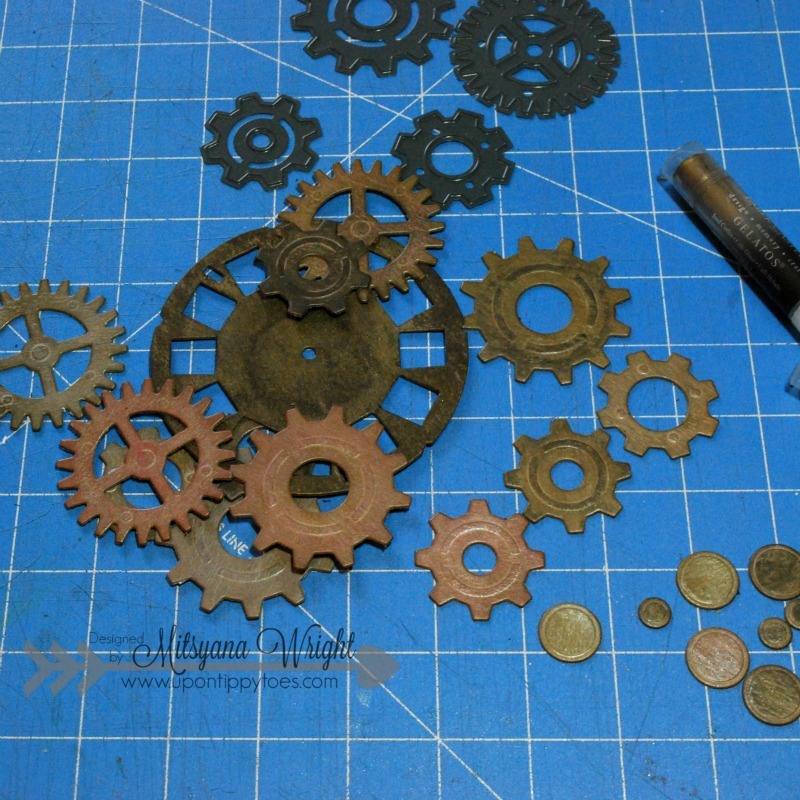 I cut out various gears using my Big Shot Machine, Darice's Gears Dies, and Tim Hotz's Picture Wheel Die. For my project I used 2 picture wheels and 3 each of all the gears. Don't discard the insdie "hole" cut-outs!! 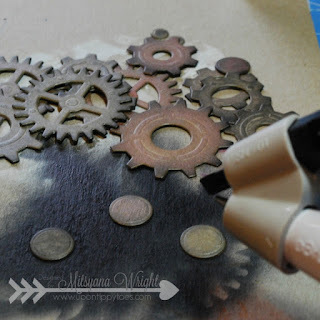 They make excellent "bolts" when stacked and layered on the gears! Then I shaded them using my metallic gelatos. I applied my gelatos directly onto the chipboard and rubbed it in with my fingers. Then to give them a grungy look. I airbrushed the edges using my Spectrum Noir True Black marker. I love to shade and distress by airbrushing!! There is virtually NO drying time! 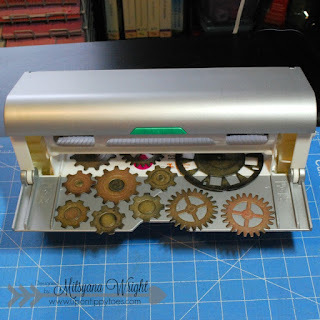 Once they were done being airbrushed I ran my gears through my Xyron Creative Station. 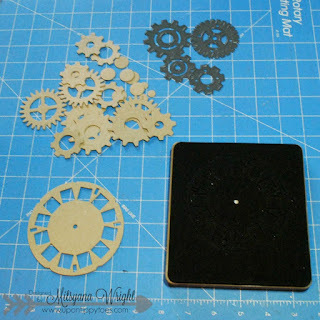 Now, It's time to attach my clock! 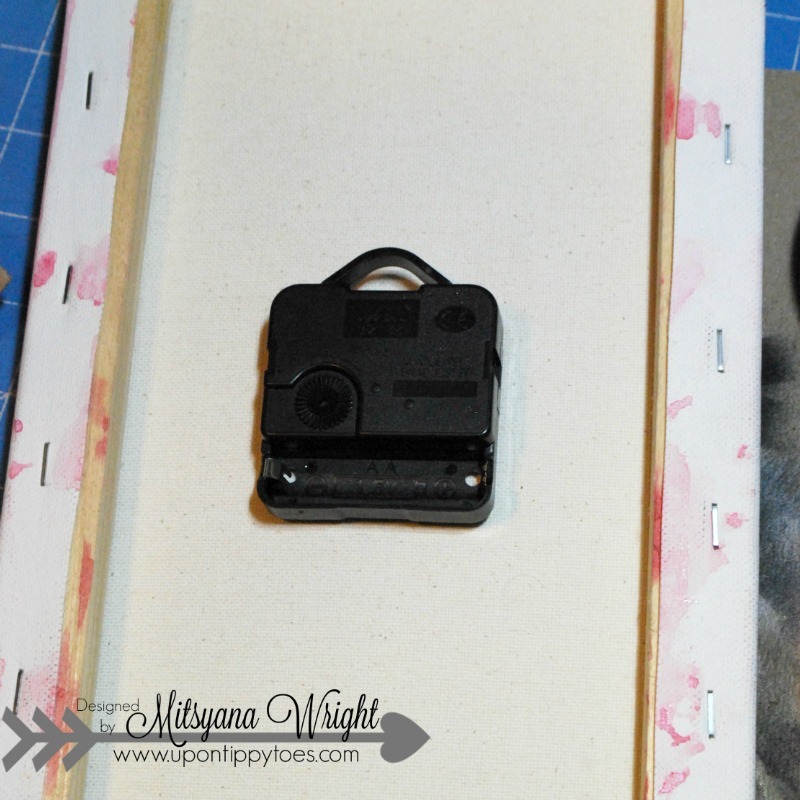 Using a drill punch, I punched a hole for my clock kit and inserted it through the hole from the back of the canvas. I love this cute little clock kit... it was the perfect width for this canvas without looking bulky or protruding out from under the canvas! 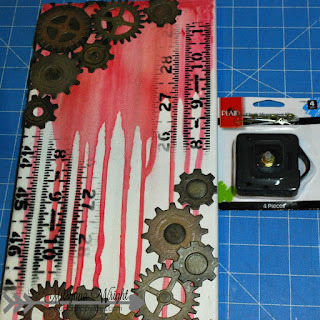 When you flip your canvas over, make sure your hole in is big enough to fit the clock mechanism through the wheel hole. Secure into place with the bolt and washer that came with clock kit. The wheel provide a sturdier surface for the clock and prevents the canvas from warping. 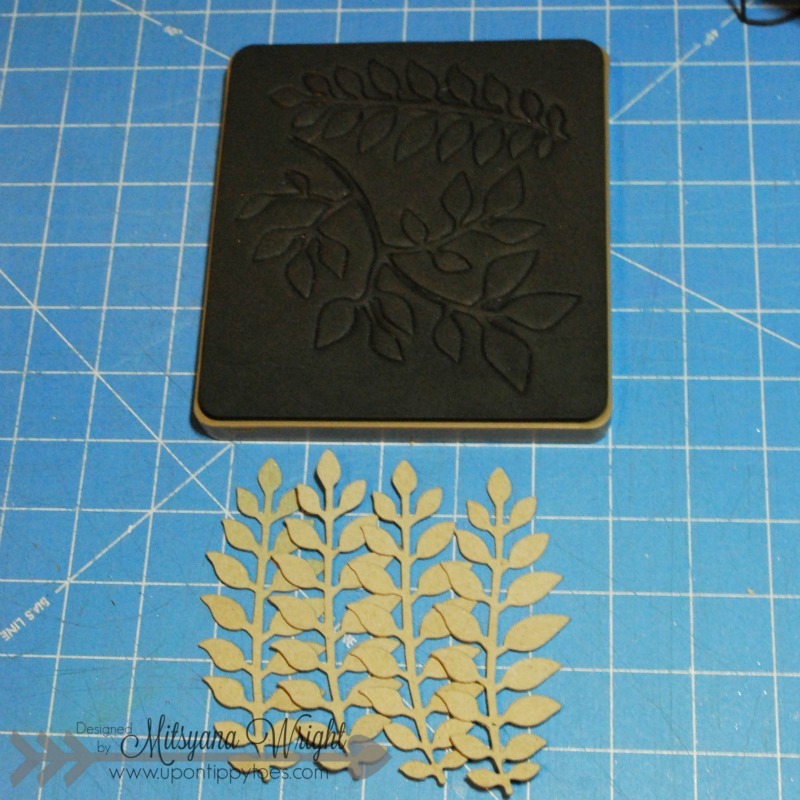 I cut 4 of these long tems out of chipboard using the Tim Holtz Garden Greens Die. 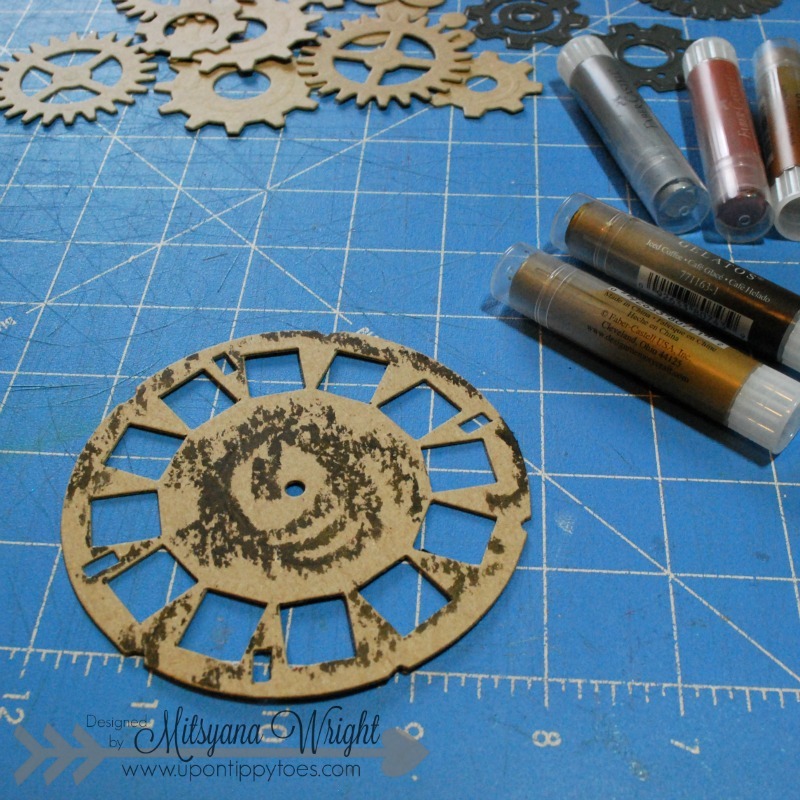 Love using my steel rule dies on chipboard... It cuts through it like BUTTER!! 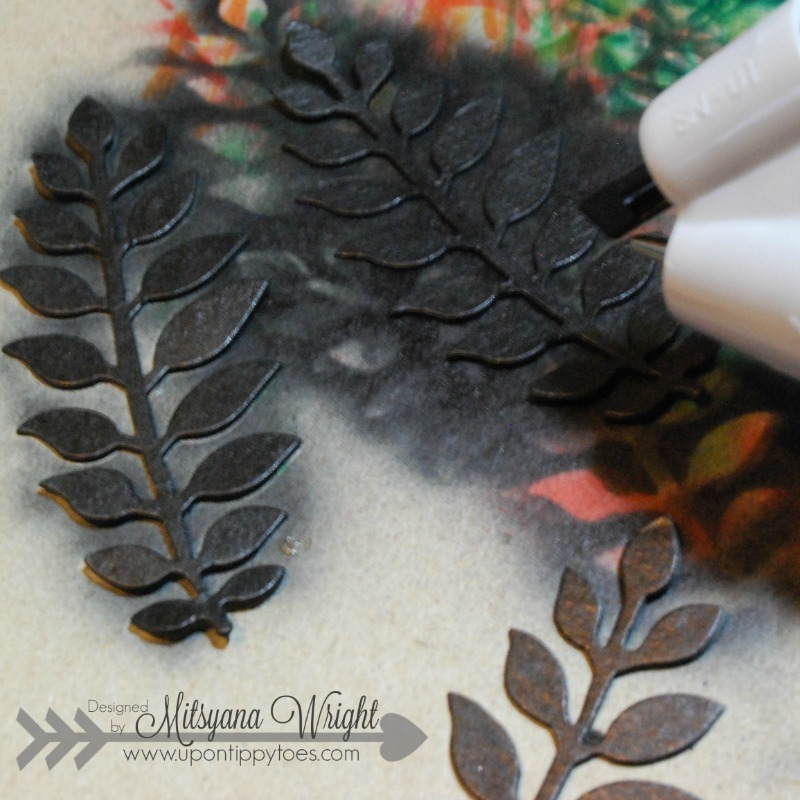 Then I ebrushed my leaves Black (again, with my Spectrum Noir True Black marker). Then I ebrushed my velvet flowers to match my canvas by using Spectrum Noir DR6 & DR7 Markers. 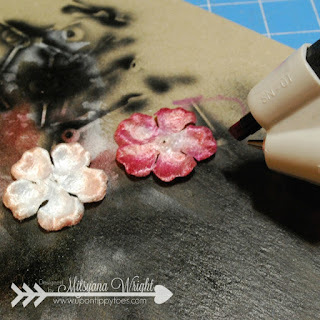 I used a total of 6 velvet flowers. 2 each of 3 different size/ shaped flowers. I inserted stamens in the largest ones and layered them on top of each other. 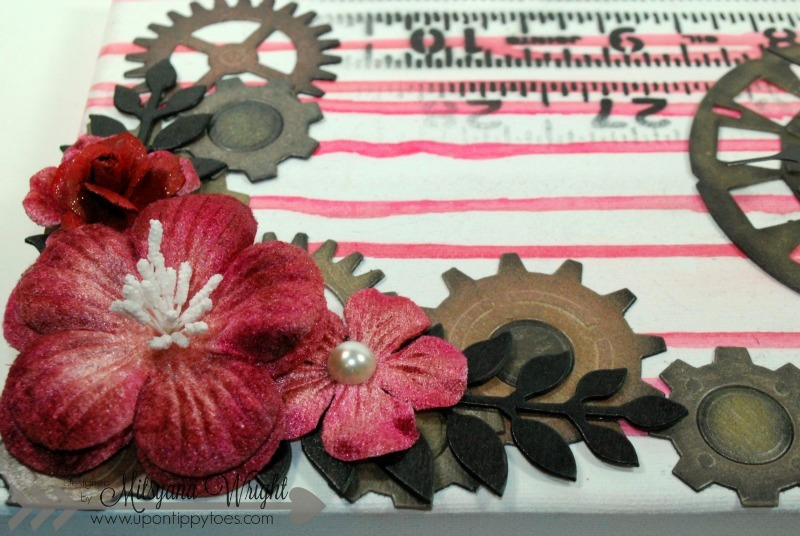 I attached flat back pearls and paper roses onto the remaining flowers. And hot glued my stems and flowers onto my canvas. The last step is to insert a battery and set the time!! 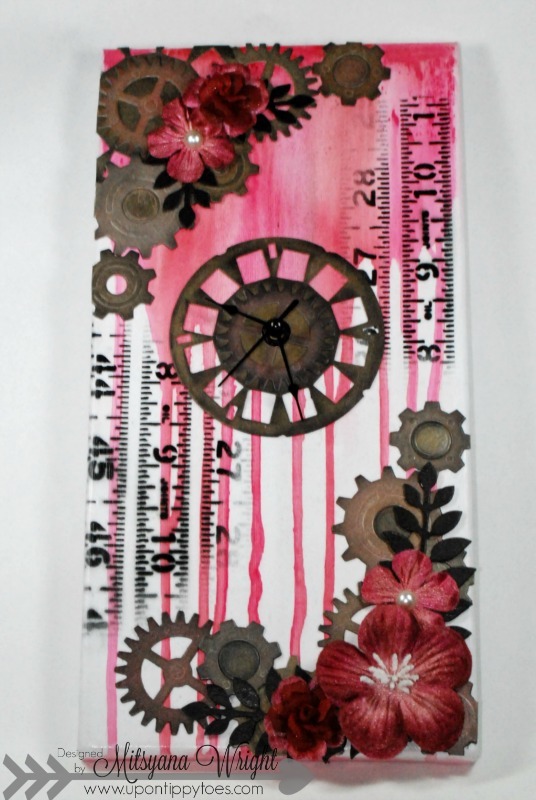 Now, I have a clock that is creatively me!! I hope you like I hope you liked this project.